Missed your bus and need to know when the next one is coming? Or perhaps you are wondering which bus you will need to meet a friend at the Clipper Gap Road and Interstate 80 park-and-ride? Answers are just one call away! 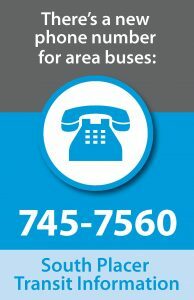 The south Placer transit agencies have one phone number to make it simple for passengers to get area bus information for Roseville Transit, Placer County Transit, Auburn Transit and the Health Express. Residents can also use this number to make or cancel Dial-A-Ride reservations. “This single phone number is a result of annual regional public hearings regarding unmet transit needs and just one more example of how PCTPA strives to hear and meet the transportation needs of the community,” says Mike Luken, Executive Director of the Placer County Transportation Planning Agency. Funding for this phone number is provided through PCTPA and the Western Placer Consolidated Transportation Services Agency. The number is 745-7560. It can be dialed within the 916 and 530 area codes.